Testimonials - Donisi LandscapeConstruction Co. The reviews below are 100% unedited. They are simply copy and pasted from our feedback email inbox directly into our website! We do our best to take care of our customers"by listening to their needs and providing creative solutions. Essentially Donisi Landscape construction Co. can take your dreams and turn them into reality. Whether you need a fully automated sprinkler system, a new concrete patio, or redo the entire overgrown and dated yard, we can handle it! Donisi Landscape Construction Co. is the one-stop-shop that can take on any outdoors residential project you throw at us! "You have been an exceptional contractor to work with. Your professionalism set you apart from your competition early on and the quality of your work has been exemplary. We appreciate the degree of communication that existed throughout the entire project. Your workers are some of the best we have ever dealt with and were a pleasure to work with, very patient with all the changes that were necessitated by circumstances beyond our control. You are a reliable and talented contractor and we have no reservation in recommending you to family and friends".
" 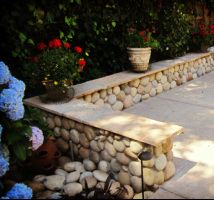 Reliable, Exceptional, Talented "
"Over the past several years Donisi Landscape Construction completed three separate construction and landscape projects at our home in Walnut Creek. Each time we were very satisfied with the quality of the work and the professional manner in which it was carried out. Most recently, Donisi Landscape Construction demolished/removed our aging swimming pool, built an outdoor kitchen, installed a patio, constructed redwood decking, removed old bushes, shrubs and trees, installed replacement landscaping and a sprinkler system along with outdoor lighting. We are very happy with our "new" backyard and would definately recommend Donisi Landscape Construction". "You and your men did a great job executing our plans as well as offering insight and suggestions on what would work best for our yard. You listened to our needs and helped solve our challenges". "I'm very pleased with the results and also just how smoothly it all came together. I can't say I'm surprised though. You and your crew are always a pleasure to work with". "Just want to thank you for the wonderful work and workers that did the cement patio for our backyard. It looks great. We will enjoy it for years to come and think of you and your workers that did the work." "The plants that they chose are good for our climate, something is always in bloom!" "You did such great work on our place, we have recommended you to several people". "Donisi Landscape exceeded our expectations. Luca took our wish list and made it come to life. His practical suggestions and artistic eye made for great results. He and his team are dedicated to high quality work without cutting any corners. They left the area clean every day and we looked forward to their pleasant attitudes as they arrived bright and early every morning. This is a top notch firm with a hardworking team. We are thrilled with the results and our yard is the talk of the neighborhood."